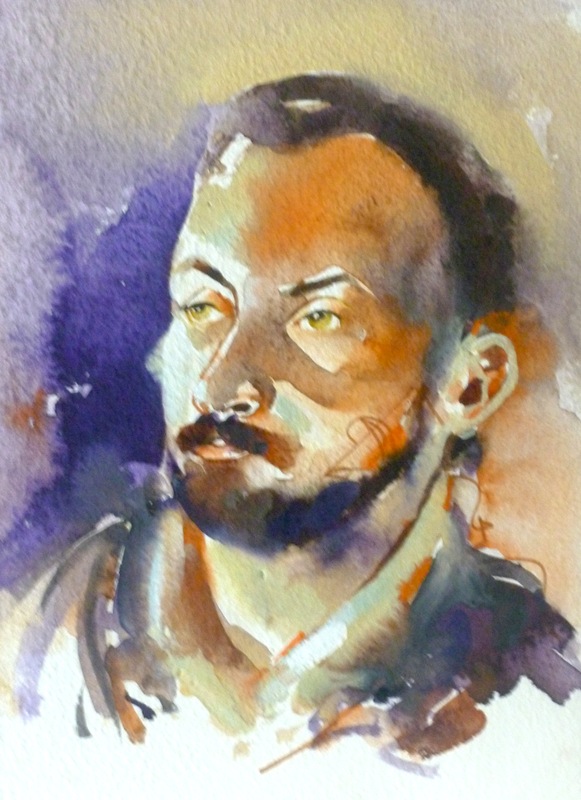 I painted watercolour portraits for many years as preliminary sketches for large oil paintings, however, it wasn’t until I returned to the UK/Europe in 1993 that I began to record people as I travelled. It all started when I had an exhibition of portraits at the Centre Auguste Brizeux in France in 1995. 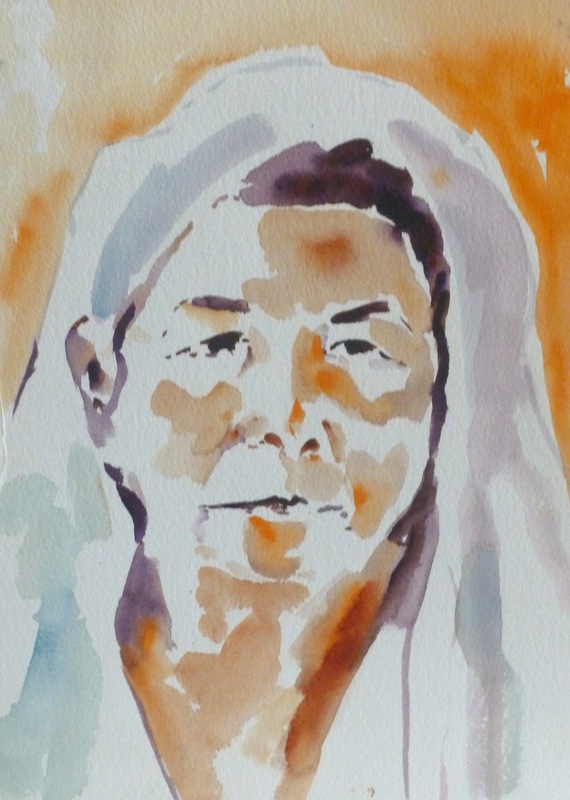 I had been asked to give a watercolour demonstration in the gallery each day and decided to paint portraits of the local people. It was because of the response I received during this period that I realised this was something I needed to do much more of. I stayed with my cousin Lyn and her family for the first six months after moving to Crickhowell, Wales. All the family became my models….. I soon realised that this method of communication was like a mediation. Although each session only lasted for a half an hour at most, and sometimes just a couple of minutes, during the process, a complete focus and connection was made with my subject. Through these portraits, people opened up to me….. I have known Tom since he was born and yet it wasn’t until I painted this quick portrait that I really felt that I knew him….I was able to get beneath the surface…and experience his essence. We had no common language, and yet during our time together there was a deep sense of communication. Surrounded by natural beauty and bird song, we observed one another as if suspended in time. I spent an afternoon with this little boy in a beautiful garden in Brittany. His parents had been recently divorced. To begin with he was very quiet….said nothing, and then as I made several quick sketches, he relaxed. By the time he had to leave, we had connected at a level that is beyond words. That was the only time I ever saw him. To this day I wonder where his life has taken him. He would be about 26 years old now. I have kept this painting. Christopher arrived in Crickhowell, Wales, in 1996. He was travelling around Europe and it had been suggested that he come visit me. He was glorious and so when he agreed to model for my weekly painting group everyone was delighted. He brought extra magic into the Magical Town of Crickadoon. I met Ken immediately after moving to Wales. As I took Bumble, my cousin’s dog for her morning walk, I would meet up with Ken and his lovely sheep dog..(who also features in the church panels as shown in my last blog) Ken told me much about the history of the area. 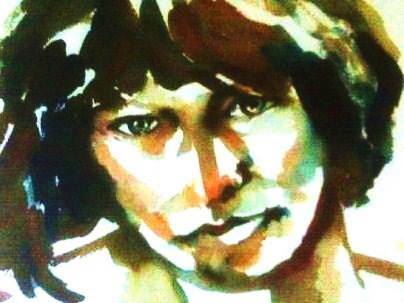 I painted this portrait of him about three years after moving to Wales. It was part of a series of portraits featuring the older people of the community. As I painted them I encouraged them to talk about their life experiences. I have these stories on tape…. 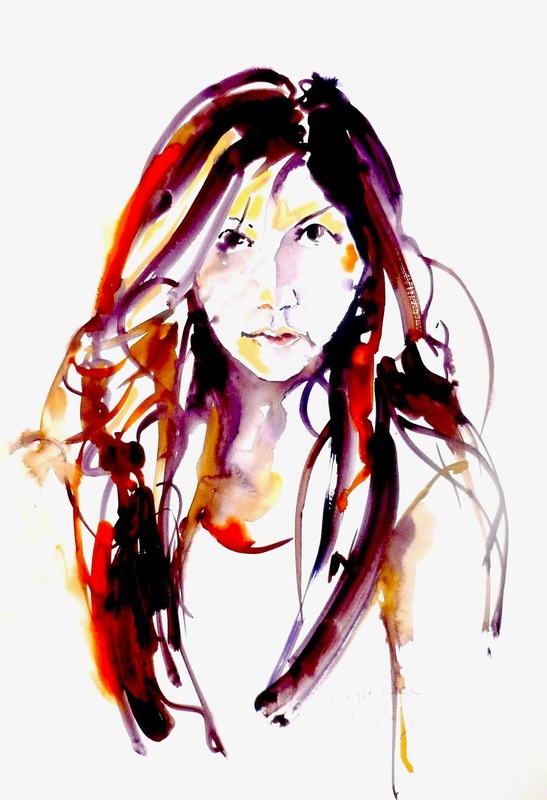 Throughout the years I have painted so many of these spontaneous watercolour portraits – I have honestly lost count….but every time I see one…sometimes many years after it was painted – I always remember the moment so clearly. 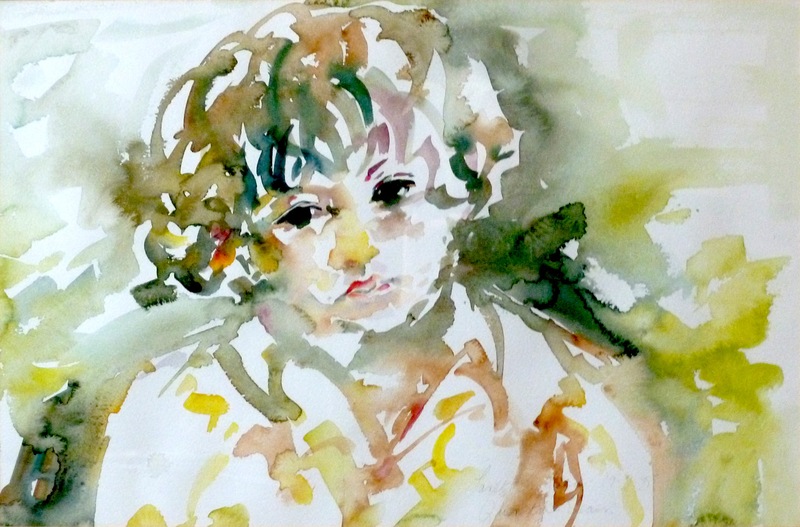 There are quite a few people who I painted when they were children who are now adults with their own children….This final portrait of Catherine in the States is an example of this. I had painted Catherine along with her brother and sisters many times when they were very young and and a few times in between, but this was the day before she was to be married….and I painted her again…what a special moment. Catherine now has her own baby, who I hope to paint one of these days. As I begin the process of writing the book about my life’s journey, it is clear to me that many of my paintings, especially the portraits, will help enormously in focusing my mind. Behind each painting there is a story – sometimes a book…. 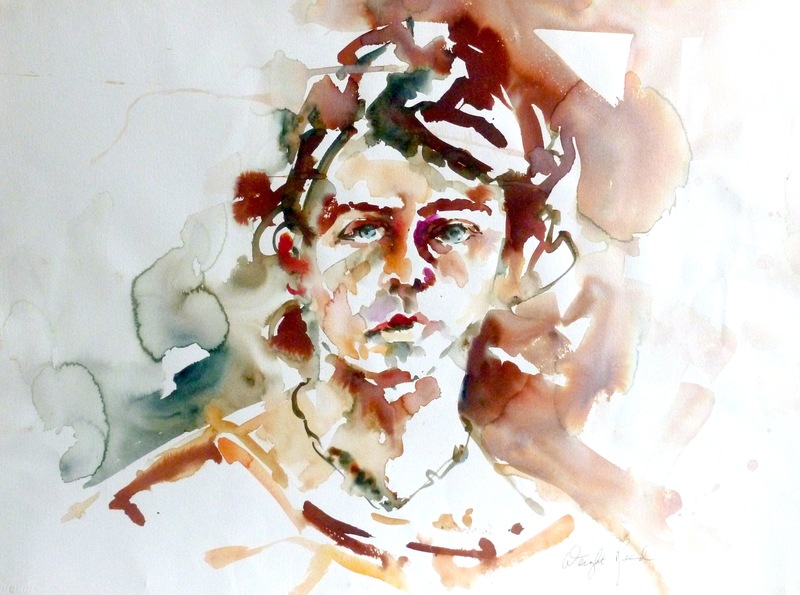 This entry was posted in Uncategorized and tagged akyaka turkey, brittan france, capturing the essence, centre auguste brizeux gallery scare brittany, crickhowell wales, janet weight reed autobiography, magical town of crickadoon, spontaneous watercolour portraits on November 12, 2015 by janetweightreed10. 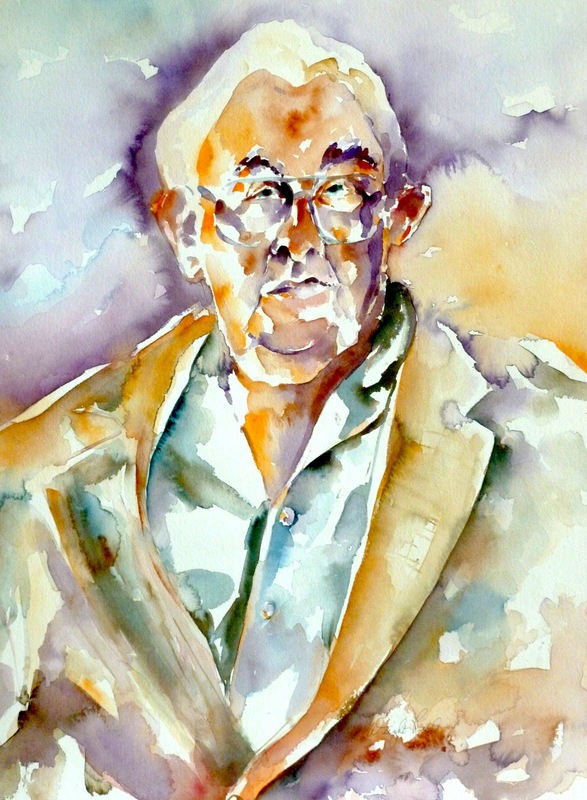 What a masterclass – thank you – the expressions in the faces of the portraits are so vivid! Super Collection Janet…..Difficult to opt for any one….each is so distinctive…. Hugs! Indeed — beyond each painting there is a book! Dear Janet, I am stunned that you can do such beautiful work so very quickly. That’s not just talent and skill… it’s some kind of magic. ⭐ It’s also wonderful that you were able to capture some of the conversations on tape. A book about your life’s journey? I think a multi-media series is in order. 🙂 ❤ You are a true inspiration. Mega hugs. Quentin and Katherine are my favorites. He looks like a little cherub! Love Lyn – relaxed and wonderful expression. All though are signatures of your amazing talents as an artist. Beautiful works Janet! Its in the eyes!…. All wonderful Janet…. inspired paintings each one. Your portraits are a blessing. They are all gorgeous, each in its own way. I love the Turkish lady because it shows how much you can connect with somebody without words. I’m not surprised they bring so many memories… Thanks for sharing, Janet. I really appreciate the re blog…Janet. 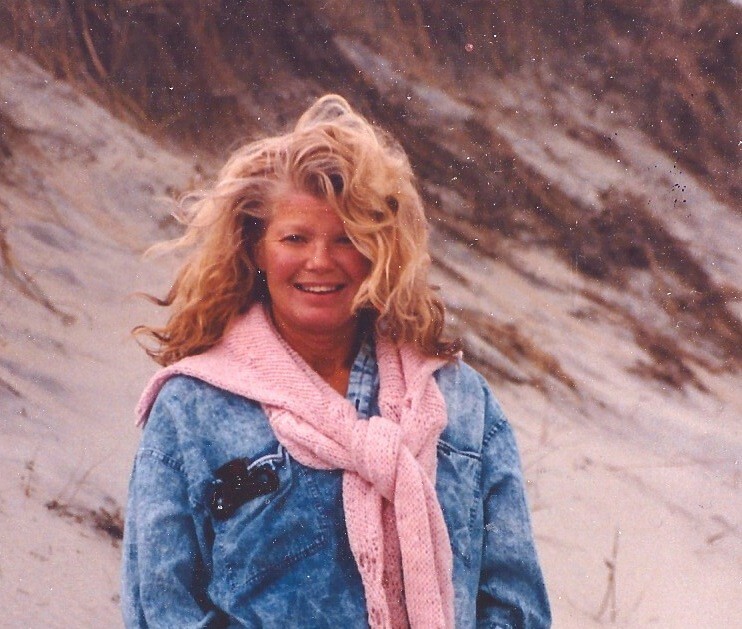 Janet, What a wonderful story you tell in this post, and how your painting absorbs me so. Quintin–What a beautiful boy you make him. And Catherine–How lovely and mysterious she is. I find a parallel to your “method of communication” in my “Growing Up Stories” in which I go back in time to describe people in my life as a child, trying to understand them now better than I did then. My father was Welsh and grew up in a place called New Tredegar and immigrated to the U.S. at the age of nineteen. Thanks for the post. Look forward to your book of memories. These portraits are amazing. So much talent for just one being! Brilliant, Janet.